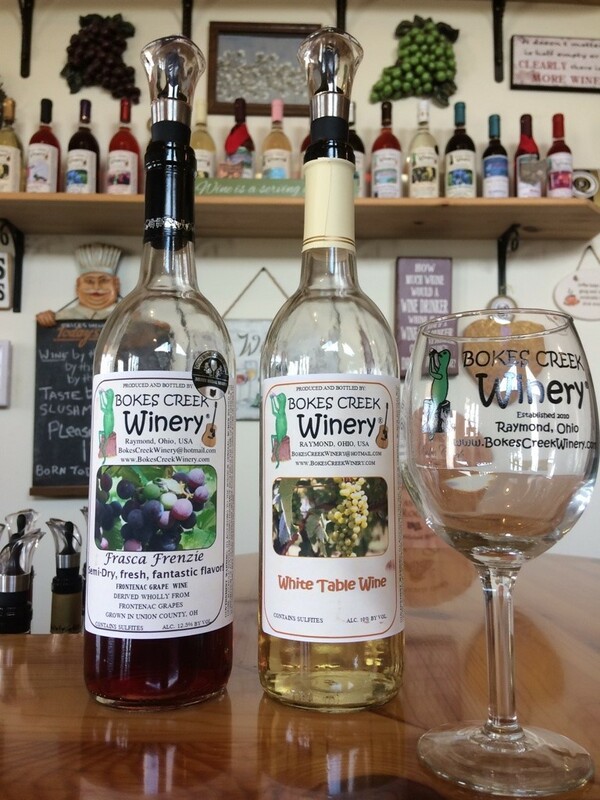 ﻿ Bokes Creek Winery - Ohio. Find It Here. The grapes and fruit are grown on our property, in Raymond, Ohio. We also bring in other local fruit to add to ours.We are very proud of the hard work that goes into cultivating and harvesting all the grapes and fruit. All grapes and fruits are then crushed and pressed into juice, and fermented on premise.This process creates wonderful, local whole fruit and grape wines, with no artificial flavor or color. There is a lot of love, care and hard work in our unique desirable local wines; the taste and goodness reflects it, along with the many awards we've won!Smiling Daisy Food Truck will be on premise Friday Oct. 26, and Friday December 28, 2018For food orders above $15,East of Chicago Pizza in Marysville (937)642-8588 does deliver here to:Bokes Creek Winery 26211 OH-31, Raymond, OH 43067.